The oxygen cycle and the carbon dioxide cycle (carbon cycle) are two of the biogeochemical cycles on Earth that make life possible. They act separately but are dependent on each other because the carbon cycle gives off oxygen for the oxygen cycle to use, and in turn, the oxygen cycle emits carbon dioxide (CO2) which goes back into the carbon cycle. Plants are the main vehicle by which the oxygen and carbon cycles are connected. Respiration, combustion and decomposition are three other ways that CO2 and/or oxygen is released back into the atmosphere. 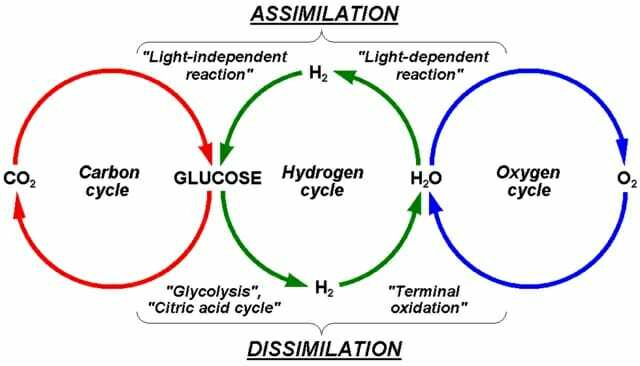 Another biogeochemical cycle, the hydrogen cycle, connects some of the pathways in nature that are involved in the carbon and oxygen cycles. Photosynthesis is the driver of the oxygen cycle. In this process, plants transform CO2 and water into sugars to use in their metabolism, help them to grow and to provide food for other organisms. The atmosphere, the total content of biological matter on the planet and the Earth’s crust are the three main reservoirs of oxygen. About 20% of the Earth’s atmosphere is composed of molecular oxygen. Some atmospheric oxygen is in the form of ozone (CO3) which makes up the ozone layer and absorbs much of the sun’s ultraviolet radiation, protecting the planet surface. Scientists think that early in the Earth’s history, oxygen was first released into the atmosphere by the action of ultraviolet light on water vapor. Life on Earth is based on carbon. The carbon reservoirs are the atmosphere, the biosphere, the oceans, sediments (including fossil fuels) and the mantle and crust of the planet. Carbon dioxide and methane are the two principal forms of carbon in the atmosphere. Plants take in CO2 and water to create sugars like glucose through the process of photosynthesis. The plants then release oxygen and water vapor as byproducts. The oxygen goes back into the oxygen cycle and the water vapor enters the water cycle. Without plants, CO2 would build up to dangerous levels in the atmosphere and add to the greenhouse effect. About 500 gigatons of carbon are stored in the plants and animals that live on the surface of the planet and the soil holds about 1,500 gigatons. Like the carbon that is used during photosynthesis, the carbon in the oceans, sediments, mantle and crust of the planet has been moving through the carbon cycle for hundreds of millions of years. Carbon can be cycled through the various processes over the course of days, weeks, months or years. It can take tens of millions of years for carbon stored in the ocean floor to be released, if it is ever released at all. Volcanic eruptions are one way that carbon-containing molecules from deep within the planet are released to the surface. The combination of burning fossil fuels (releasing CO2) and deforestation (reducing photosynthesis and carbon storage) caused by humans is disrupting the carbon cycle in a negative way. Cellular respiration is the process by which animals take in sugars and oxygen and emit CO2, water and energy. Insects, fish, birds, mammals, reptiles and amphibians all respire in some fashion by using specialized systems and pathways that have evolved over millions of years of natural selection. CO2 is released into the atmosphere by natural combustion in several ways including volcanic eruptions and forest fires. As was mentioned earlier, the combustion of fossil fuels and other human activities has had an alarming impact on the Earths carbon cycle. This is evidenced by the increase in carbon release due to human activity from 1 billion tons in 1940 to over 6 billion tons by the year 2000, and continues to increase to this day. There is a limit to the amount of carbon that the oceans and plants can take up, so the rest remains in the atmosphere and increases the greenhouse effect, causing climate change. When a plant or animal dies, the carbon and oxygen and other components like water, calcium, nitrogen, etc. are returned to the soil and air through the process of decomposition. Fungi, bacteria and some insects (called decomposers) are responsible for decomposition, and most require oxygen to carry out the process. The image above shows the interrelationship between the carbon, oxygen and hydrogen cycles in plants.